British Prime Minister Theresa May vowed on Monday to stick to her draft European Union divorce deal as dissenting lawmakers in her own party tried to trigger a leadership challenge. Since striking a deal with the EU on Tuesday, May has faced the most perilous crisis of her premiership with several ministers resigning, including her Brexit minister. May has pledged to fight on, warning that toppling her risks delaying Britain's exit from the EU or leaving without a deal, a step that could thrust the world's fifth largest economy into the unknown. Even if she stays in place, the level of opposition from eurosceptics in her own ranks has made clear how hard it will be to get the deal through parliament. "We have in view a deal that will work for the UK and, let no one be in any doubt, I am determined to deliver it," May said in a speech to Britain's premier business lobby, the CBI, to loud applause. "We are not talking about political theory but the reality of people's lives and livelihoods." "While the world is changing fast, our geography is not: Europe will always be our most proximate goods market, and ensuring we have free-flowing borders is crucial," May said, citing the importance of the automotive industry in particular. The EU is due to hold a summit to discuss the draft deal on Nov. 25. Some Brexit-supporting ministers are reported to want to rewrite parts of it, though Germany has ruled this out. The EU's Brexit negotiator, Michel Barnier, said the draft deal was "fair and balanced". 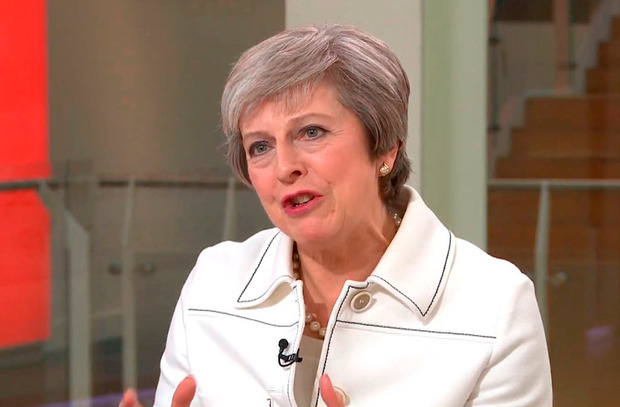 May said she wanted any Brexit transition, during which Britain will remain a member in all but name and voting rights, to have ended by the time of the next national election, due in 2022. More than two years after the United Kingdom voted to leave the EU, it is still unclear how, on what terms or even if it will leave as planned on March 29, 2019. Many business chiefs and investors fear politics could scupper an agreement, thrusting the economy into a no-deal Brexit that they say would weaken the West, spook financial markets and silt up the arteries of trade. CBI President John Allan said such a Brexit would be a "wrecking ball" for Britain's economy while CBI Director-General Carolyn Fairbairn said politicians were playing a high-stakes game that could lead to an accidental 'no-deal' departure. "Surely, surely, we can do better than this," she said. Asked about the unpopularity of her deal among many in her party, May said voters should listen to business. However, rebels in her own Conservative Party who say the deal will leave Britain in indefinite subjugation to the EU are attempting to trigger a vote of no confidence in her leadership. The chairman of the party's "1922 Committee", Graham Brady, said on Sunday the threshold of 48 letters from lawmakers had not yet been reached. He also said if there were a vote, May would win. The Sun newspaper said the rebels were six letters short. One of them, Simon Clarke, told BBC radio: "This day must be the point at which ... action is taken." But by 4 p.m. (1600 GMT) on Monday there was no sign of a formal challenge. Sterling, which has fluctuated wildly in response to the political turmoil, was flat at $1.2860. Since she won the top job in the turbulence that followed the 2016 referendum, May’s premiership has been characterised by obduracy in the face of frequent crises. Her biggest challenge will be getting the deal through parliament. The DUP, a small Northern Irish party that props up her minority government, has threatened to pull its support because the deal could end up treating Northern Ireland differently from the rest of the United Kingdom.